In a Nutshell: Zopa changed the financial makeup between borrowers and lenders by challenging the banks and setting up shop online in 2005. Zopa is the world’s first — and Europe’s largest — peer-to-peer lending service, having lent more than £1.73 billion to responsible U.K. borrowers. The company’s practice of connecting lenders and borrowers directly has enabled it to grant lower interest rates than many traditional banks. Over 63,000 lenders, meanwhile, have reaped the rewards with greater returns on their capital. The process, which doesn’t affect credit scores, is easy, expedient, and shakes up the way the U.K. does business. Before 2005, generally, if you wanted to borrow money in the United Kingdom, you went to the bank. Unless, of course, you were one of the fortuitous few with a wealthy, generous group of friends and family you could approach. On the flip side, if you wanted to accumulate interest on your money, you invested in the stock market or opened a savings account. Zopa turned these limitations into an online opportunity to connect both sides of a loan for a mutual benefit. In other words, the possibility of that dream vacation or car, or simply consolidating a few bills was realized in an innovative way, through the creation of a platform for responsible borrowers to save money through lower APRs on loans. Conversely, the platform allows users with extra capital to lend money to strangers in good financial standing. Since Zopa’s launch, investors and lenders have had an opportunity to do business through peer-to-peer lending (P2P), also known as social lending or lend-to-save. Launched in 2005, Zopa pioneered the peer-to-peer lending industry. The financial whizzes who founded the company in 2004 were in the zone when they created Zopa, which stands for “zone of possible agreement.” Simply defined in business terms, zone of possible agreement is a bargaining range where negotiations happen and agreements can be reached between two parties. Outside this zone, there is no shot of play in the business sandbox. The press first compared the U.K.-based company to eBay and Betfair and, in fact, today Zopa is backed by firms who invested in these and other internet companies. With a staff of 187 in their London office, Zopa is the world’s first — and Europe’s largest — peer-to-peer lender, having lent more than £1.73 billion to U.K. customers since 2005. Committed to properly rewarding good personal money managers, Zopa helps responsible people avoid paying exorbitant interest rates. In fact, Zopa lends over £2 million every day to creditworthy individuals at rates that are often lower than traditional bank rates. To apply for a loan through Zopa, a user will need to confirm their identity online and meet eligibility requirements — being a U.K. resident who is at least 20 years old and can provide a healthy credit and income history. There’s a three-minute online application, and if approved, users get a tailor-made fixed loan rate. The process is free, and quote inquiries don’t affect credit scores. Decisions on loans are made by the Zopa team within two working days. On approval, up to three working days later, the money is distributed. Borrowers can expedite the process by paying £57.50 for the Fast Track option, which yields money within one working day. Personal loan perimeters are from £1,000 to £25,000 over one to five years, and APRs start as low as 3.9%. Of course, rates and fees depend on individual circumstances like credit scores and personal specifications of loans. Realistically, Zopa has to make money, and they do so by charging a low, upfront fee. The borrowing fee, which is added to your loan amount and always included in your APR quotes, is only charged when the application is approved. Additionally, borrowers don’t have to worry about early repayment fees or penalties. Once approved for a loan, the quote is saved for users for seven days. This time period affords members a feasible window of opportunity to shop around with different loan providers for comparison rates before finalizing the deal. Before 2005, if you wanted to invest and watch those pounds grow in healthy proportions but didn’t want to follow the market or get too high risk about it, what was the easiest, surest way? Choices were slim, as was the interest that most banks paid on savings. Zopa remedied this situation, and before you could say, “Nest egg!” investors had a new opportunity to make their investments grow. With individual lenders and borrowers matched online, lenders have enjoyed significantly higher returns. 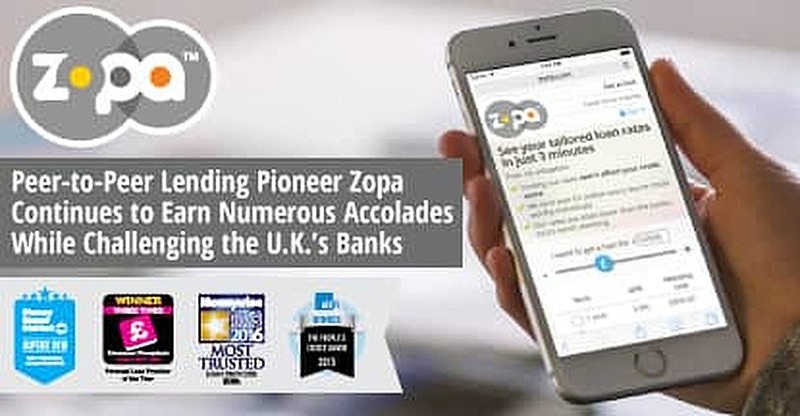 The U.K.’s largest peer-to-peer lender base with over 63,000 lenders comprise the Zopa circle of trust to grow their money. You can lend up to £25,000 through Zopa, and your money is divided among 50 borrowers to minimize risks of default. You also have the option to sell your loans to withdraw all, or a lump sum, as long as other lenders agree to buy them. This process has been successful in the past, but is not a guarantee. If you sell your loans to another lender, and they are worth less than the open market, a premium may be charged; for example, if rates for loans have increased. No lending is risk-free, but Zopa offers lenders three different options to choose from that are based on risk and reward. Regardless of what selection interests you, as borrowers repay, you can withdraw money. Zopa offers lenders three options to grow their money, each with their own level of risk-and-reward. Which tier is the best? Consider the Zopa Access option if you are a new investor who withdraws occasionally from the piggy bank as borrowers repay their loans. The minimum investment is £10, but Zopa recommends at least £1,000. The annualized projected return is 3.3%. This return is calculated after expected losses on money lent out, since when you lend your money, your capital is at risk and is not protected by FSCS. In addition, there is no fee if you decide to sell your loan. Zopa Classic, on the other hand, is for the investor who wants to sock the money away and watch it grow. In this case, 4.1% is the annualized projected return, including expected losses on money lent out. The minimum investment for Zopa Classic, the same as Zopa Access, is £10, but Zopa recommends at least £1,000 for better returns. The Zopa Plus option is for lenders who have a cool £1,000 to invest for a higher annualized projected return of 6.5%. This plan is for you if you are willing to accept higher levels of risk to achieve potential higher returns. Both Zopa Classic and Zopa Plus investors can sell their loans for a 1% fee. Meanwhile, Zopa Access and Zopa Classic investors have a cushion, Zopa’s Safeguard fund, which protects investments and is held in trust by a third party not-for-profit organization. Thus far, Safeguard has provided the perfect safety net and returned all money owed to lenders. Since, however, the risk margin is higher for Zopa Plus, investors aren’t covered by Safeguard. And, because peer-to-peer lending still involves risk, your money is not protected by the FSCS compensation scheme. Note, that with Zopa’s solid track record, the company has a higher repayment rate than the banks. Different backgrounds and goals make up the legion of lenders. One thing that’s unmistakable is the ease in the process of becoming a lender. Basically, you open an online account in which you can transfer your bank account’s funds. Then, you choose one of the three lending options, and your money is deposited into a queue with other lenders’ money where capital is matched with borrowers. Lending capital is typically lent out within a week and divided into at least £10 to be divvied out to different borrowers. You can recycle borrowers’ repayments or withdraw them. You’re in control of when and how to access your money. Simple, right? Five-star reviews and an array of awards for their outstanding performance in the lending field as well as customer service over the years have made consumers stop and take notice. For instance, Zopa is a three-time winner of Moneyfacts’ Personal Loan Provider of the Year and was voted Most Trusted Personal Loan Provider in Moneywise Customer Service Awards from 2010 to 2016. The kudos keep rolling in. Celebrating P2P and customer service awards has become commonplace for members of the Zopa team. Meanwhile, a broad range of businesses, from brokers and affiliates to retailers and banks, that want to work with a company that provides unrivaled customer services and simple, efficient money-making experiences, have partnered with Zopa. With a solid track record and 5-star reputation on Trust Pilot, Zopa is branching out its lending services to the consumer product arena. For instance, the company has partnered with Unshackled to provide two-year loans for consumers who prefer to finance a mobile phone instead of paying for it in full. Through Zopa, the pioneer of peer-to-peer lending, people can invest in other people. Zopa offers lenders and borrowers superior options in cash flow practices that were once unheard of. No longer limited to interest rates offered by banks, Zopa allows people to connect on both sides of a loan for a mutual benefit. Thanks to Zopa, the power of money is exchanged between those who have marched up the ladder of responsible money management. Lenders have great opportunities to grow their capital, while borrowers reap the rewards of lower interest rates. The practice of matching strangers is no longer strange. It’s become widely accepted to the benefit of borrowers and lenders in the U.K.